Decentralized…what does it mean that? 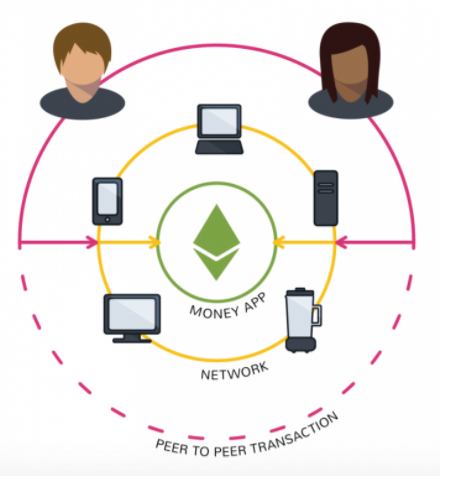 What is a Decentralized Application? What is Bitcoin? Internet users don’t have sole control over the data they share on today’s websites. Ethereum is unique in that it attempts to wield the blockchain as a way to correct what its designers believe is a problematic part of the internet’s design. It’s like a “decentralized appstore” where anyone can publish their unstoppable apps (dapps), which unlike today’s apps (think Gmail or Uber) don’t require a middleman to function or to manage a user’s information. Dapps connect users and providers directly. One example is to use this design for a decentralized Twitter that’s resistant to censorship. Once you publish a message to the blockchain, it can’t be erased, not even by the company that created the microblogging system. There isn’t one definition of a dapp, though, as it’s a newer concept. A couple of main characteristics are that they’re open source and don’t have a central point of failure.